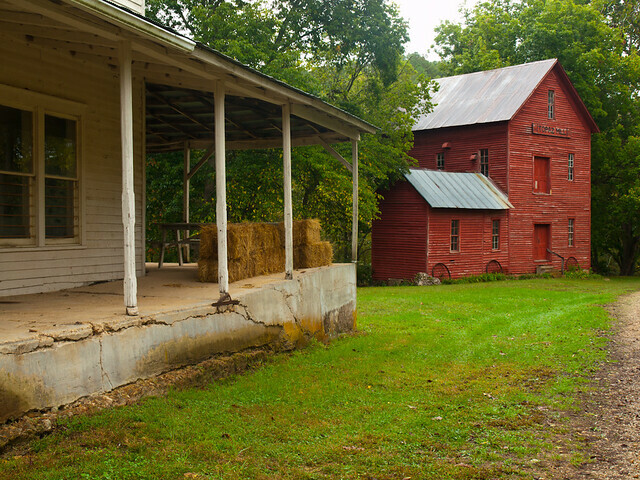 The last mill that we visited on our tour of Missouri is perhaps one of the most popular mills in the state: Alley Mill. We visited it last year, and I was eager to see it again. The only problem was that there was a decent chance it would be closed. 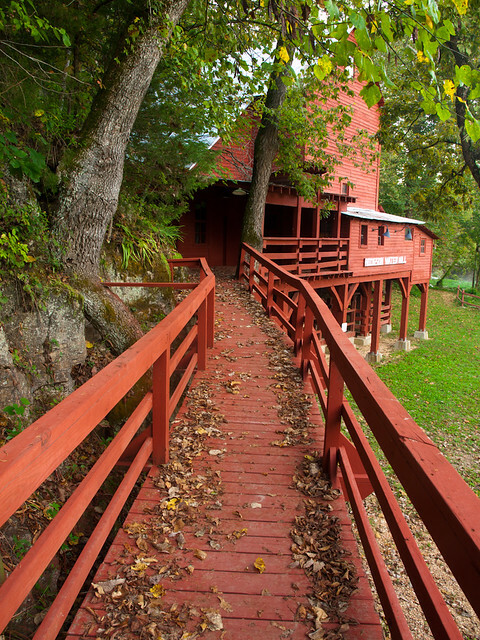 The mill is part of the Ozark National Scenic Riverways, which was closed like all of the other national parks. But we drove on towards the park. I was a bit nervous as we passed by campgrounds and access points that were shuttered and closed. But lo and behold, the area around the mill was open! Or well, not surrounded by a phalanx of plastic barriers. We happily went to see the mill, which is well worth the drive to Missouri. 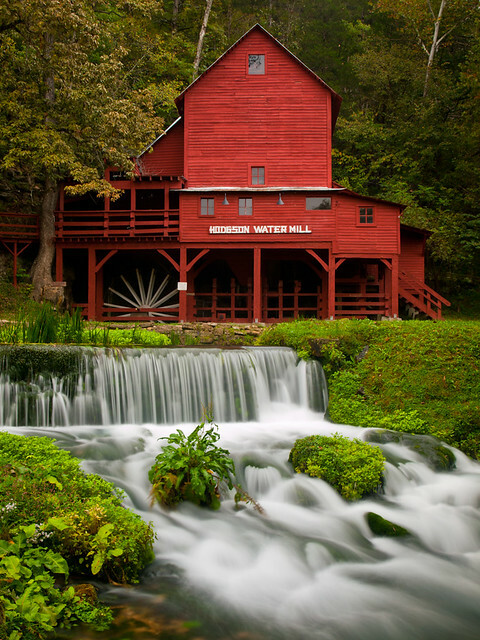 Alley Mill was built in 1894, next to a spring that expels about 81 million gallons of water a day. 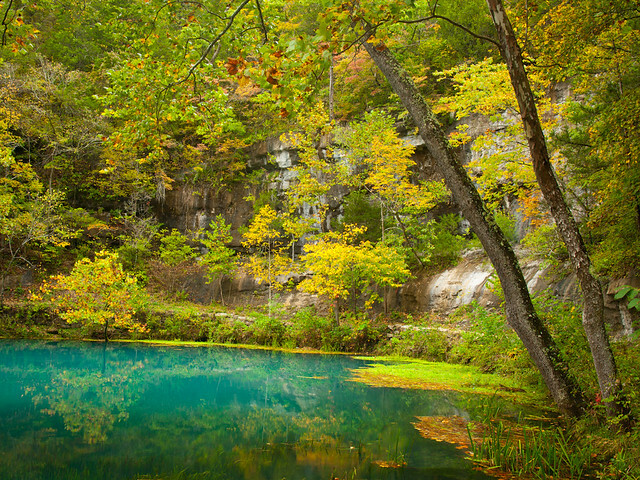 The spring (which is the 8th largest in the Ozarks) sits below a tall bluff. It was only the first weekend in October but there was already some decent fall color there. 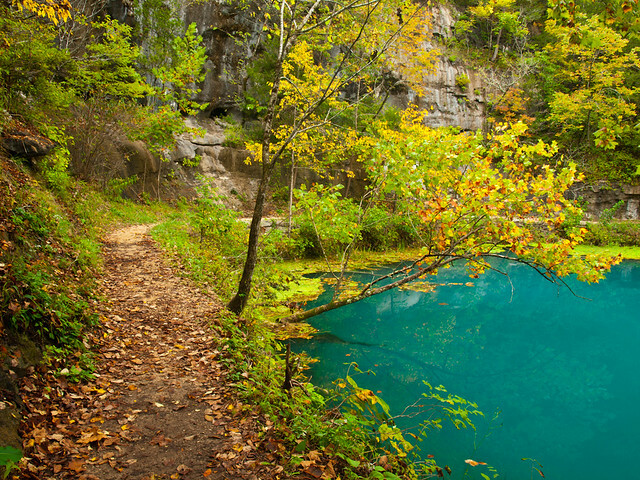 The water from the spring has a really deep blue color, thanks to suspended particles of limestone and dolomite. It's an amazingly beautiful area. My only complaint is that I wish it was a little bit closer to home. 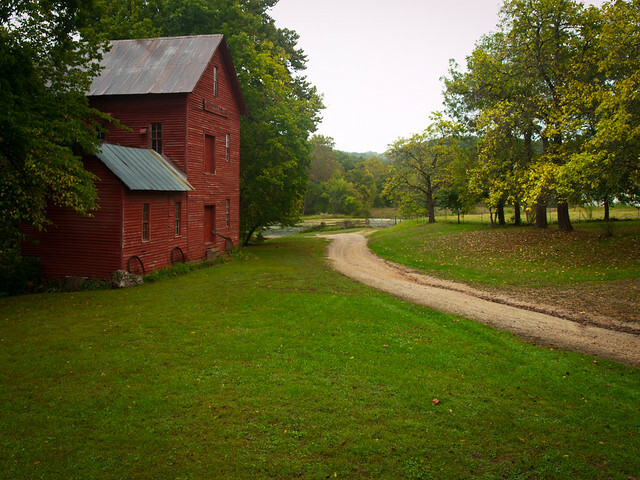 To get to the next mill, we drove north in the rain through the Mark Twain National Forest. 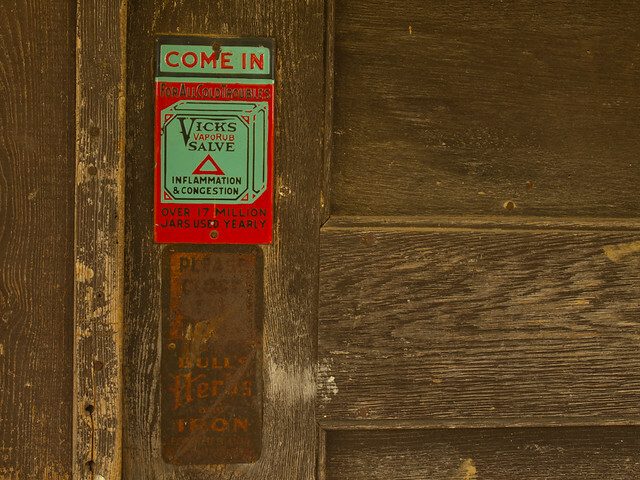 Tucked deep in the woods, down a bumpy dirt road, was the Topaz Mill. 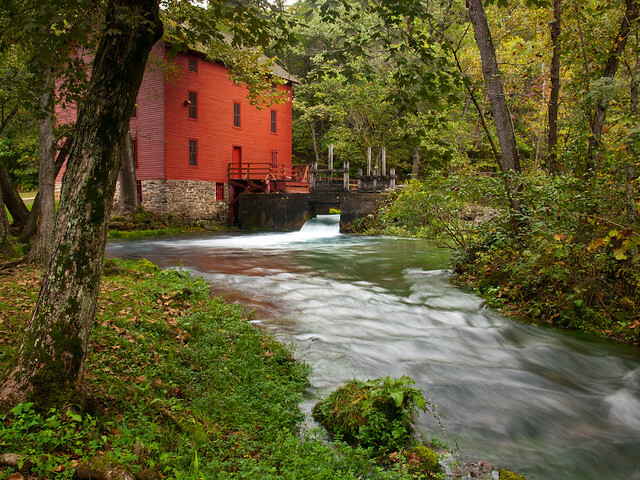 The mill was first established in 1840, around a spring that has a daily flow of 11 million gallons. The current mill here was built in 1896. 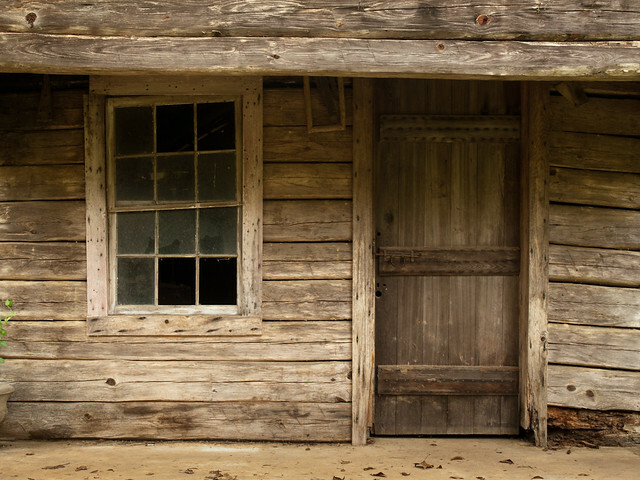 It was once the center of a small pioneer village, but all that remains now are the mill and an old general store. 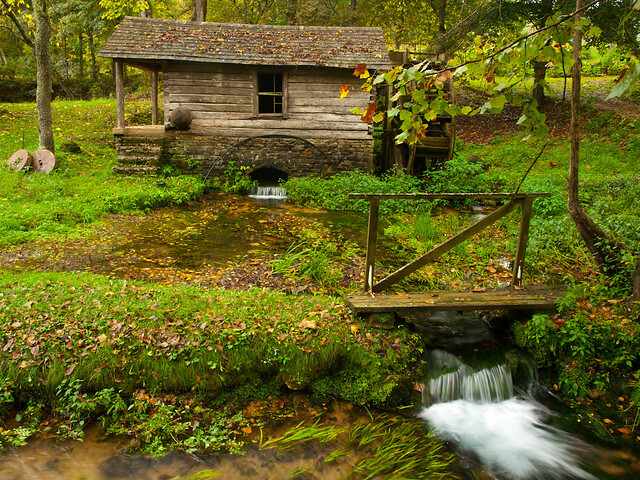 The mill closed down in the 1930s, but the spring waters still gush around it. We stood in the rain taking pictures and then headed out to another mill, which would take a bit of driving to get to. So after a quick bite for lunch, we drove east under gray and cloudy skies. 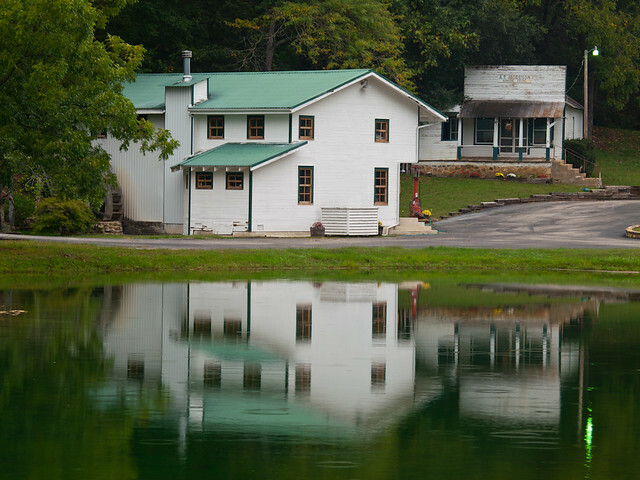 A bit later we passed through the small town of Centerville, and drove to the Reed Springs Mill. 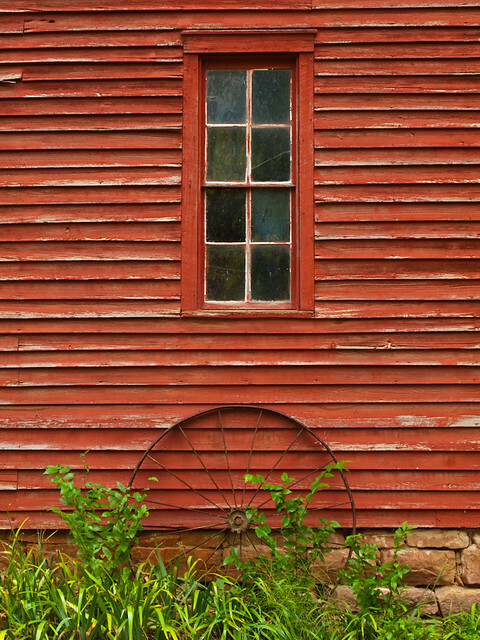 The mill here was built over a spring in 1881, and was used to grind corn. The turbine was also used to generate electricity. 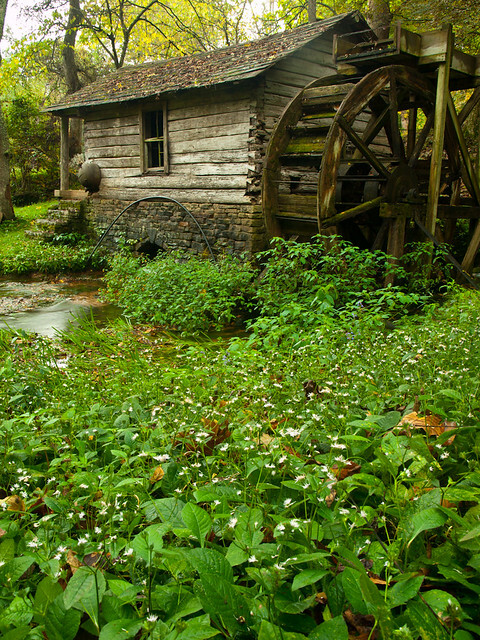 This isn't the original mill, but actually a reproduction. 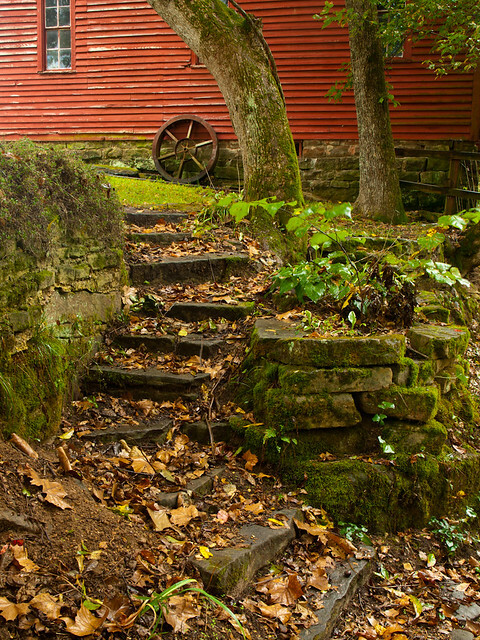 The first mill here was taken apart, stone by stone, and sent to San Francisco for the 1939 World's Fair. A reconstruction was built here, while the original is now part of the Smithsonian. We crossed over the border into Missouri and soon made it to our campground, which sat just above the North Fork of the White River. I was surprised to see that the campground was nearly empty (of people, there were thousands of bugs out there). There was only one other person staying there, who we discovered when the car headlights swept across his campsite. I can't really say anything about how people camp, since I usually sleep in my car. But the guy at this campground was laying out on the rough concrete picnic table at the campsite. We weren't entirely sure if he was camping, or laid out as some sort of sacrifice for the woodland critters. We woke up early the next day, and drove off before sunrise. 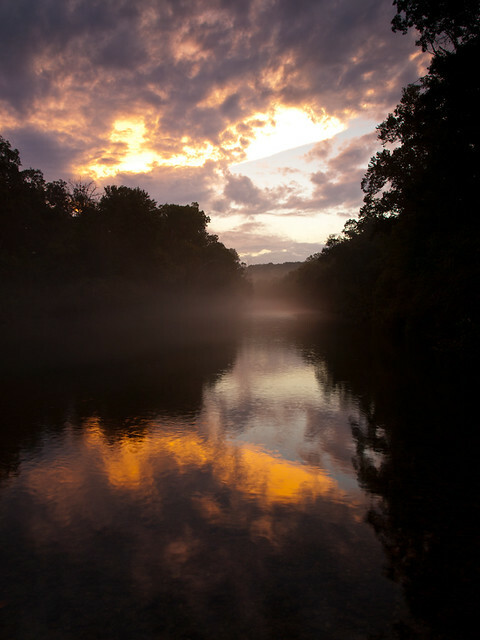 We drove over the river and caught this view of the sunrise, above the small bit of fog drifting over the river. From there it was a short drive to Hodgson Mill, which is considered to be one of the most photographed buildings in all of Missouri. And I can believe it, because it's a beautiful building in a beautiful setting. 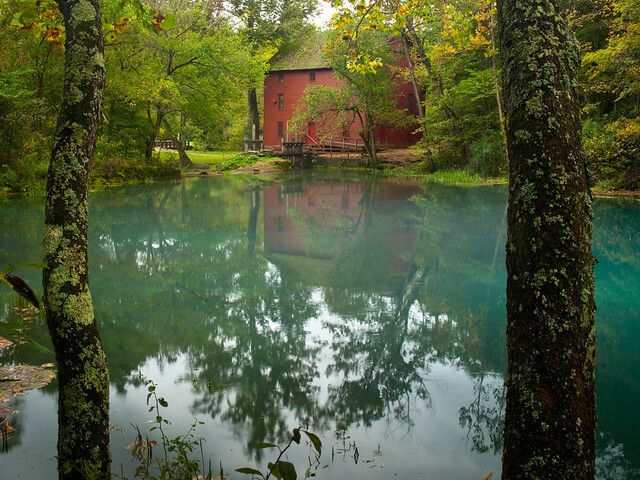 A spring pours out from beneath a bluff, passing under a mill that dates back to 1897. 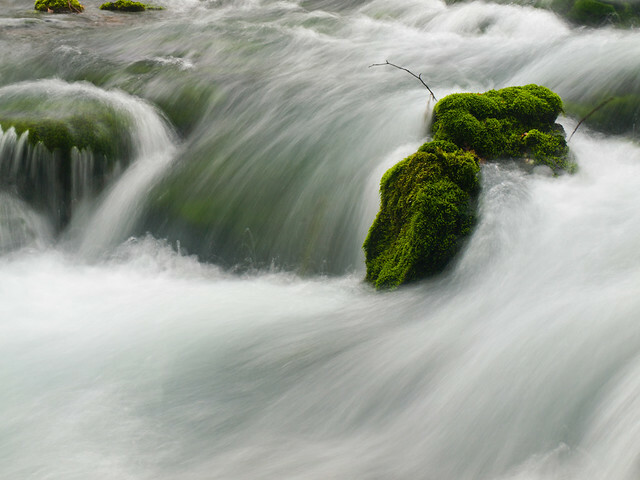 The waters of the spring gather in a small pond before cascading over a waterfall. 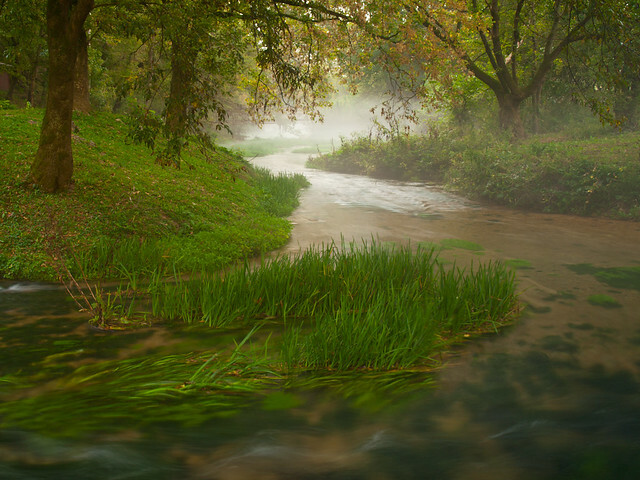 23 million gallons of water flow from the spring every day, creating this creek. On the morning we were there, fog drifted over the waters. 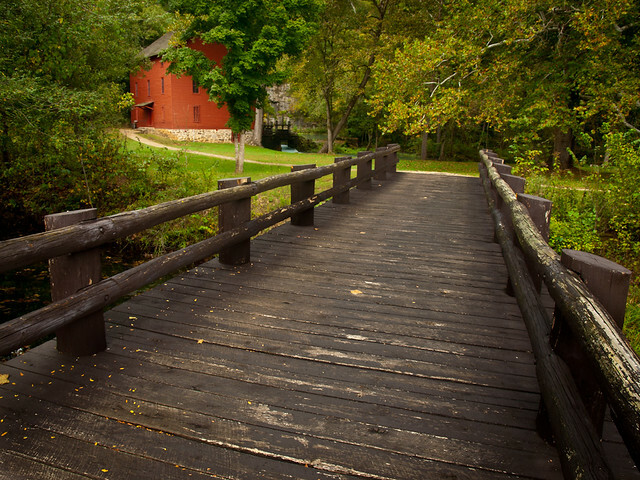 This is the walkway to the mill, which was closed that morning (granted it was about 7:50 am). 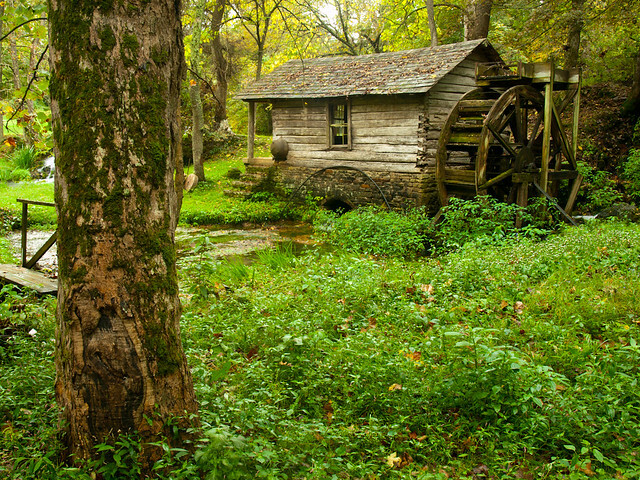 The first mill was built here in 1861. 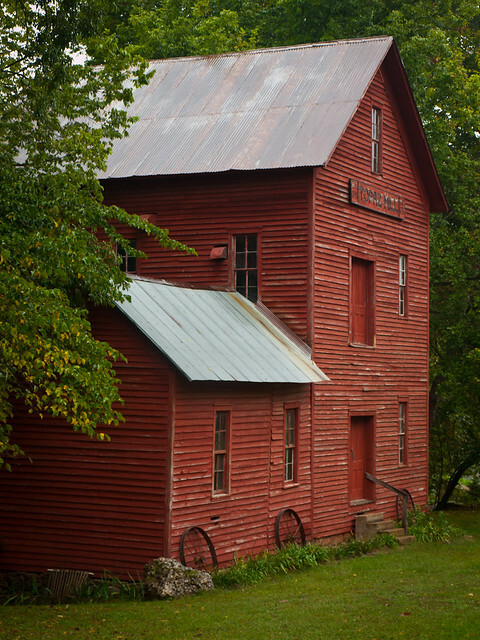 The current mill building was built in 1897 after the original building burned. 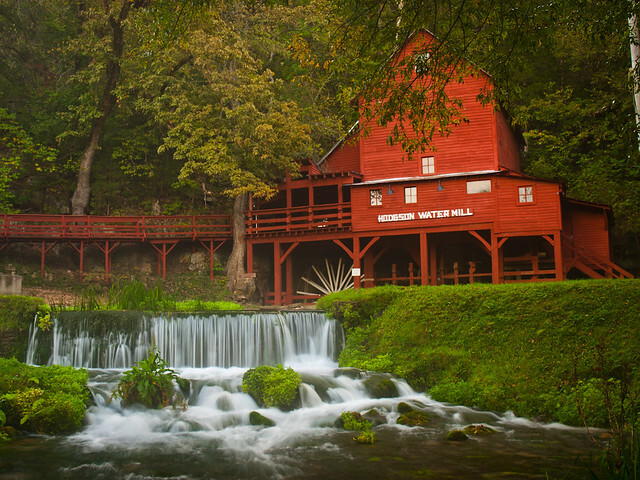 The mill sits right above the spring, which is the 19th largest in Missouri. 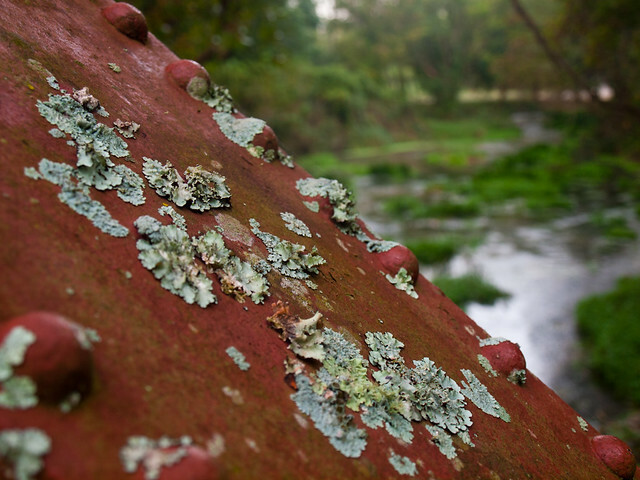 Just downstream was an old bridge, painted red to match the mill. There was a lot of moss perched on the edge of old iron. The sun never really rose that day. A band of thunderstorms were closing in, and it would rain on us for most of the rest of the day. I was more than happy since it meant plenty of time to take pictures of every angle of the mill. 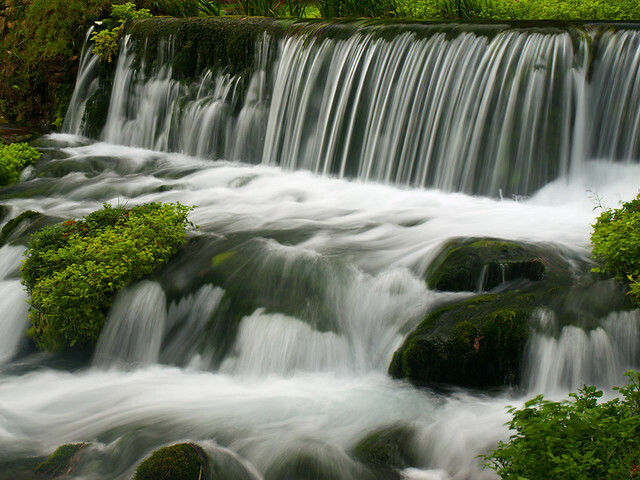 This is a close-up view of the waterfall that tumbles over in front of the mill. Last year, Zack and I decided to make a spur of the moment trip and visit southern Missouri. 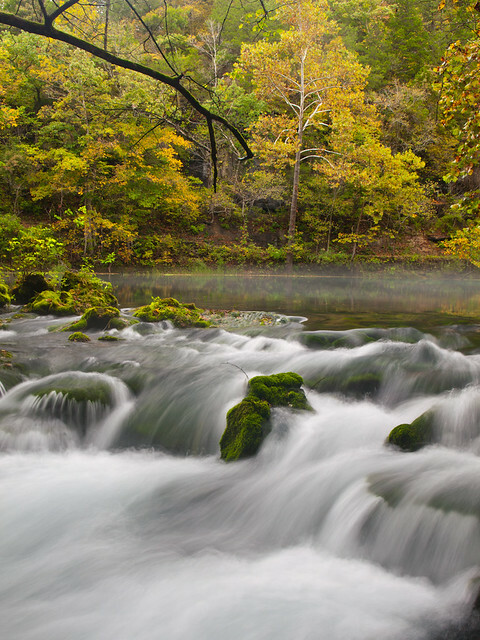 We didn't really plan anything out, but somehow managed to catch the Missouri Ozarks at just the perfect time. The fall colors were right at their peak, and we saw some amazing places that are just a short distance over the border. I've been wanting to go back ever since, especially during the fall. But my schedule is going to be fairly busy the next few weeks (a wedding will do that, I guess). So we decided to head up last weekend for a return visit. Along the way up to the Missouri, we drove up through the small town of Cotter and stopped to take some pictures of the old bridge. 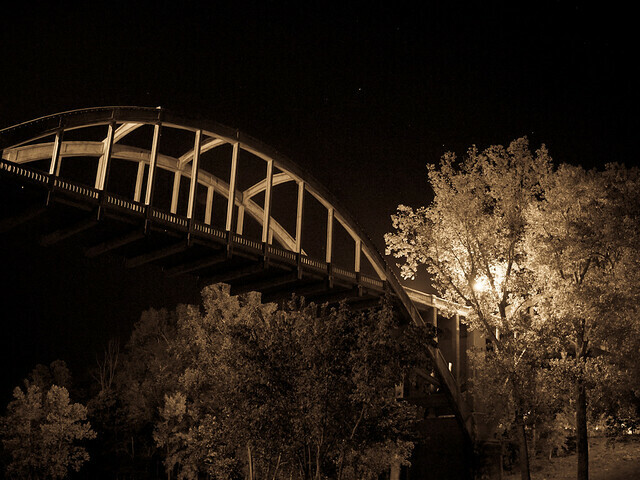 The bridge is an old rainbow arch truss bridge that was built in 1930 over the White River. I had hoped it would have a bit more light on it at night, but it was a pretty place to stop.